The aim of this lecture is to present on Types of Energy. The two main types of energy are: Kinetic Energy and Potential Energy. Kinetic Energy is energy that is in motion. Moving water and wind are good examples of kinetic energy. Potential Energy is measured in the amount of “work” it does. Potential Energy is stored energy. Examples of potential energy are oil sitting in a barrel, or water in a lake in the mountains. 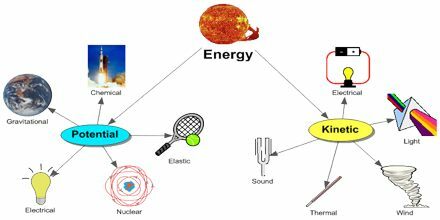 Some other types of Energy are: Thermal, or heat energy, Chemical Energy, Electrical Energy, Sound Energy, Nuclear Energy etc.